Meeting this Thursday and a Michael Miller fabric challenge! Get ready, get set… it’s guild meeting week! Our February meeting will be this Thursday, February 20 at 7PM at Rock Paper Scissors. We have a LOT of things to talk about, some of which I’ll update the blog about as we get closer to meeting time. But most excitingly…. 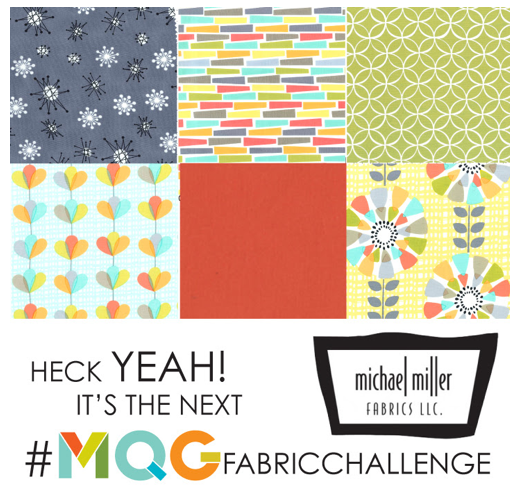 the MQG is sponsoring a Michael Miller fabric challenge! We will sign up as a guild and distribute fabric accordingly. If you’re interested in participating, please leave a comment on this post (especially if you can’t make it to the meeting). I will also announce it at the meeting and pass a sign up sheet. There will be three national winners who will each receive a goody box from Michael Miller every month for a year. As for our own guild quilt block challenge, blocks aren’t due until the March meeting, but if you have them, we’d love to see them! Also bring a name tag and a chair with something for show and tell. It feels like forever since our last meeting. I can’t wait to see everyone! Hi Diane! Can you please email the list to me? We had a board meeting this morning and figured out what we want to do with it. Thank you so much for looking into all of this. It is so useful for us. I’ll be there, along with my Modern block. Glad I’m around for this meeting! Let’s hope the weather gods are in our favor by Thursday night. We’d love to have you! Rock Paper Scissors is at 15 Bloomfield Ave in Montclair, in the Panera complex near the back. See you then! I just got an e-mail from the modern guilt guild announcing this challenge and was hoping we would sign up for it! I definitely want to play. I won’t be at the meeting, please include me in the MGQ challenge.